Macintosh endpoints are not immune to security threats. That’s why it’s imperative that businesses deploy security to Mac endpoints just as they do to Windows endpoints. Cybercriminals are after data, and they don’t care what type of endpoint holds it. Broad protection — Secure all endpoints on your Macintosh systems against all types of viruses, spyware, phishing attacks, and exploits. Centralized, integrated management — Use the same web-based console to manage both your Mac and Windows endpoints. Easily deploy protection for all of your Macs from a single interface. Intuitive, Macintosh-like interface — Get up and running quickly, with minimal training. Endpoint Protection for Mac uses Apple’s Mac OS X Aqua user interface, so you can deploy and manage from an instantly familiar Macintosh screen. McAfee® Endpoint Protection for Mac secures Apple Macintosh endpoints with complete, advanced protection, including antivirus, antispyware, firewall, and application protection. It stops malware and other security threats before they can damage or infect Macintosh desktops and laptops and spread throughout your company’s network. McAfee Endpoint Protection for Mac also addresses compliance requirements by ensuring that Macs meet the same level of protection as Microsoft Windows-based PCs while maintaining or even reducing operational costs. With the increased popularity and market share that Apple enjoys, business users are asking to bring Macs into the workplace. McAfee Endpoint Protection for Mac lets you say “yes” with confidence. Myths and misconceptions abound when it comes to Macintosh computers. One of the more interesting is the idea that Macs are somehow impervious to the kinds of security attacks (viruses, Trojans, spyware, and more) that Windows-based PCs are. The reality is that they are just as vulnerable. In fact, the use of Macs may create small gaps in your security perimeter that are large enough to allow hackers in, enabling them to infiltrate the rest of your network. When Macs were rare in the business world (outside of design studios and creative agencies), this wasn’t an issue. But with the growing market share of the Mac platform and the need for organizations to demonstrate 100% compliance with security requirements, protecting your business means protecting the Mac endpoints of your end users. Fortunately, with McAfee Endpoint Protection for Mac, meeting this requirement is just as easy and cost-effective as it is for the Windows-based PCs in your organization. And by consolidating management of your endpoints, you improve security compliance across the entire enterprise while saving in operational costs. Macs are gaining market share—while the market share for Windows-based PCs is dropping. Macs are chosen by more and more business users, from marketers to engineers to executives. Macs in the workplace often contain the same sensitive data—or have access to that data—as other PCs. As a result, hackers and cyber-criminals are coming to see Macs as a target with a greater potential payoff than in the past. Bottom line: Companies need to secure Macs as they would their Windows-based PCs. Report on and enforce security policies on Macs to ensure endpoints fully comply with your security standards. Use a single web-based console to manage both Mac and Windows endpoints. Endpoint Protection for Mac integrates seamlessly with the McAfee ePolicy Orchestrator (ePO) platform, saving you time and money. Rely on advanced scanning functions for fast and accurate threat protection that doesn’t impact system performance. Prevent malicious attacks designed to steal data from being downloaded or installed on your Mac endpoints. Trust McAfee Labs, our 24/7 Global Threat Intelligence team, to ensure your protections remain strong and up to date, even as applications and environments change. Secure your endpoints against every type of virus and malicious code threat, even those hidden in compressed files, with advanced heuristics and generic detection from Endpoint Protection for Mac. Neutralize spyware before it takes root and spreads by stopping spyware and other potentially unwanted programs (PUPs) before they install and start stealing personal information. Stop network-based attacks with inbound and outbound firewalls to prevent unwanted network activity. Ensure same network firewall policies can be enforced on both Mac and Windows endpoints. Prevent malicious programs from modifying applications, and allow or deny applications that are not approved to run on your Mac. As Macs have entered the mainstream workforce, McAfee has responded with mature security technology that keeps pace with emerging threats. This isn’t your father’s antivirus. With its advanced anti-malware protection that includes antispyware, a robust system firewall, and application protection (as well as antivirus), McAfee Endpoint Protection for Mac offers complete coverage for the Mac users in your organization. Antispyware stops spyware and other potentially unwanted programs (PUPs) before they install and start stealing personal information. On-access scanning is always-on protection that also provides selective scanning functions to improve system performance. Desktop firewall stops network-based attacks from infecting the Mac, closes the door on cybercriminals while allowing legitimate traffic, and even stops probes from identifying vulnerabilities. Application protection provides the ability to deny applications that are not approved to run on your Mac and prevents malicious programs from modifying existing applications. Lower operational management costs by making it easier to manage all endpoints with fewer resources. Respond faster to security incidents, regardless of where they originate. Confirm compliance with security requirements, supported by powerful reporting capabilities. Update security settings on all endpoints—PCs and Macs—at the same time. McAfee ePO software delivers these benefits to organizations with any number of users in today’s dispersed workforce—regardless of their location or preferred endpoint or software platform. McAfee Endpoint Protection for Mac provides the most advanced firewall protection for Apple Macs in the market. Prevents unauthorized access to specific networks, subnets, hosts, IP addresses and domains. Tracks the outgoing network connection and ensures that the incoming connection is in response to the outgoing connection. Keeps your managed Mac in compliance with your organization firewall policies, by enforcing the same network firewall policies on Mac and Windows systems using a common McAfee ePolicy Orchestrator software extension. Prevents access to unauthorized websites using DNS blocking policy. Protects your Mac inside and outside the office using location-awareness policy. The application-protection feature of McAfee Endpoint for Mac protects against data-stealing threats that attempt to modify existing legitimate applications or install new malicious software. Allows administrators to determine which applications are approved to run on your Macs—and prevent all others from installing or executing. Prevents malicious programs from accessing incoming or outgoing network connections. Locks down Mac endpoints to ensure compliance with company policies. Cybercriminals don’t much care where they get their data from. Just like legitimate businesses, what they do care about is maximizing their investment. That’s a key reason why, when Macs made up a tiny fraction of market share and were used primarily by college students, designers, and musicians, criminals didn’t pay much attention to them. But that’s changed. The conclusion for business is clear: As the market share for Macs grows and Macs play a continually more important role in the enterprise network, companies must make sure they’re protected. “Security through obscurity” will no longer be a sufficient defense. 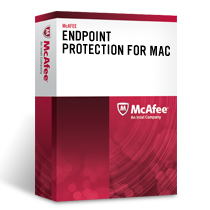 Download the McAfee Endpoint Protection for Mac Datasheet (PDF).